Coding bootcamps are often called a “fast track” to well-paying tech jobs. And with lower tuition costs, shorter class times, and a practical learning curriculum, these alternative education schools are praised for increasing access to a tech education. But are coding bootcamps really worth it? We’ve asked hundreds of alumni about their investment and whether it paid off – here’s what we’ve found. Short answer: the data says YES. 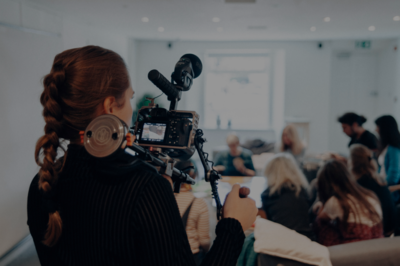 If you want the long answer, let’s dig a little deeper into what makes an educational program worth it and how coding bootcamps measure up. What makes a good educational experience in tech? Right now, most university computer science programs are four years long and you can expect your tuition to ring in at about $163,140. The average bachelor’s degree holder earn $59,124. On the other hand, coding bootcamps are ~14 weeks long and average $11,874 in tuition. And the average coding bootcamp graduate earns $70,698. Our Takeaway: Bootcamp students can learn how to code faster and cheaper with guided support in smaller class sizes, and bootcamp graduates actually make more than college grads. Can I calculate my bootcamp ROI? To understand if a bootcamp is worth it, you’ll need to calculate two figures: your total investment and your starting salary goal. Starting Salary Goal: According to Course Report’s research, coding bootcamp graduates report an average of $70,698, with a median salary of $65,000 in their first jobs. On average, expect to make ~$70K per year. A coding bootcamp ROI calculator. This coding bootcamp ROI worksheet. How Much Will I Make After Bootcamp? Here are the facts – overall, 75% of coding bootcamp grads are employed full-time and take 1-6 months to get their first job. 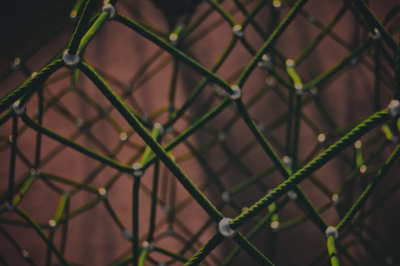 Everyone will have a different job search journey, but it’s important to remember that networking with other tech professionals and utilizing the coding bootcamps career services help is vital to landing your first job. In Course Report’s most recent study of 1450 graduates, we found that coding bootcamp graduates earn an average of $70,698, but this increases as developers gain seniority in the industry. 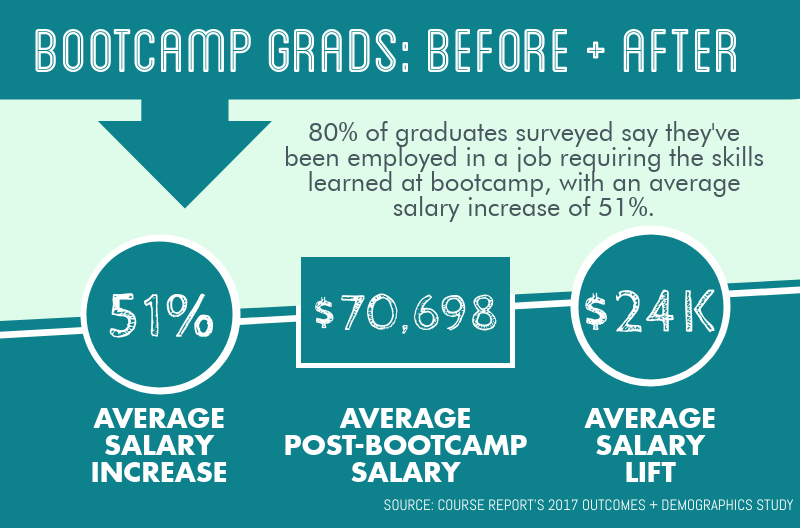 On average, graduates earn $79,944 at their second job after bootcamp, and $90,421 at their third job after bootcamp so salaries typically increases by 25% as bootcampers progress in the industry. If you're interested in how coding bootcamp grads perform a few years out, Flatiron School surveyed more than 150 alumni who graduated one to four years ago to find out how their careers have positively progressed. 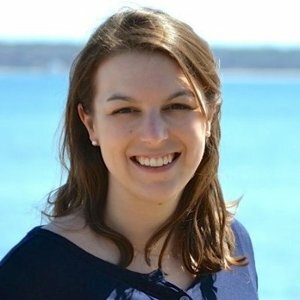 Watch VP of Career Services, Rebekah Rombom, share what coding bootcampers can expect their career trajectories to look like. Are coding bootcamp grads actually getting jobs? Coding bootcamps are intensive, accelerated learning programs that teach digital skills like Full-Stack Web Development, Data Science, Digital Marketing, UX/UI Design, and Cybersecurity. In Course Report’s latest Outcomes Report, 80% of respondents say they've worked in a job requiring the technical skills they learned in the bootcamp. So if you have aspirations of becoming a software developer or data scientist, or a tech-adjacent job like a product manager, a bootcamp may be worth it. How Much Will I Pay for a Coding Bootcamp? While coding bootcamp tuition is substantially less than a traditional university, there’s still an important financial commitment when attending bootcamp. The average tuition for a coding bootcamp is about $12,000, and the use of external lending partners has increased dramatically over time – about 20% of students used a lending partner like SkillsFund or Climb Credit in 2017. And with the rise of deferred tuition and income sharing agreements, you can avoid paying tuition until you get a job. 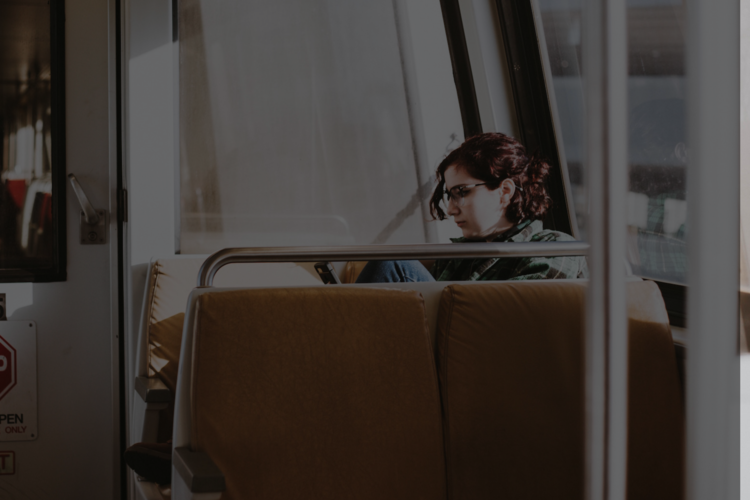 There are various ways to pay for a coding bootcamp – be sure you’re choosing an option that covers your costs, but doesn’t leave you with high-interest debt. How can I make sure I get these results? Find a coding bootcamp which you can afford, or figure out how much you can afford to borrow. Consider deferred tuition bootcamps. Make sure you have the time and budget to fully commit (that may mean quitting your job!) during the bootcamp. Work hard throughout coding bootcamp – go above and beyond what is required during the program (like Ileana), and learn even more than what the curriculum requires. Make sure you have projects and examples of your work that you can show to employers. Don’t stop working hard once you graduate from bootcamp – continue looking for a job with the same intensity and read up on technical job interviews. Do alumni think a coding bootcamp is worth it? Do employers think a coding bootcamp is worth it? Employers continue to use coding bootcamps as a tech talent pipeline to fill roles – we’ve found that bootcamp alumni are working in over 650 different companies. And it’s not just startups! In 2018, established companies like Google, Facebook, LinkedIn, Amazon, Dropbox, JPMorgan, Goldman Sachs, and Amex all hire from bootcamps like Fullstack Academy and the Grace Hopper Program. Bootcamps are evolving with industry trends, adding computer science fundamentals to their curricula, and employers are taking notice. Set your expectations and salary goals before you attend a coding bootcamp. What’s your endgame? Are you a career changer or are you trying to get a promotion? Will your projected salary be worth it? Give yourself room to be open about the experience. Setting expectations is key but be sure to adapt to the learning experience. You may find that you like working with one language over the other, or that your career goals have shifted throughout the bootcamp. Be ready to do the work. No coding bootcamp will “give you a job.” Expect to work hard and hustle to get your first job after graduating.